17 Best Pumpkin Pie Recipes just in time for Thanksgiving dessert! Who is ready for Thanksgiving? Ok, to be honest I haven’t thought about it much. Although I’m starting to get in the holiday spirit. 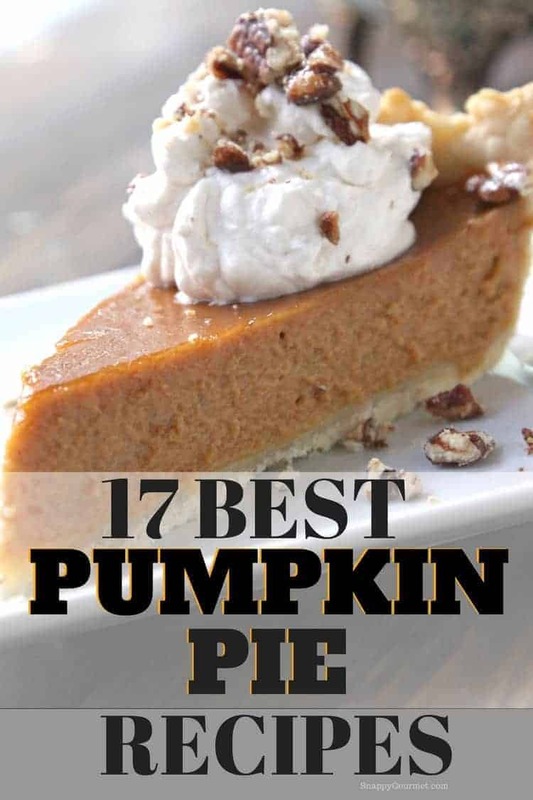 BUT for you today, I do have 17 Best Pumpkin Pie recipes for you today to get you started on your Thanksgiving menu! Here’s a variety of homemade pies to try although you may not want to make all 17 at one time, ha! The pumpkin pie recipes are from a variety of bloggers and websites so hope you enjoy! From boozy pies, to double layers and no bakes, to began and diet specific, there is a pie recipe for everyone! 1. Irish Cream Pumpkin Pie Recipe (Snappy Gourmet) – From scratch pumpkin pie with a fun twist with a little Irish Cream liqueur. Yum! 2. Pumpkin Cream Cheese Swirl Pie Recipe (Let’s Dish Recipes) – The best of both worlds, pumpkin pie and cheesecake! Beautiful swirls of cheesecake takes traditional pumpkin pie to a whole other level! 3. No Bake Double Layer Pumpkin Pie Recipe (Recipe Girl) – No room in the oven to bake a pie? How about this double layer pumpkin pie recipe that doesn’t need to be baked! A layer of pumpkin a layer of cream cheese with whipped topping. Fun! Even the homemade graham cracker crust doesn’t need to be baked. Easy! 4. Libbys Pumpkin Pie Recipe (Libby’s) – classic homemade pumpkin pie with Libby’s canned pumpkin, evaporated milk, and spices. 5. Pumpkin Chess Pie Recipe (The Spiffy Cookie) – fun idea combining the classic southern chess pie and pumpkin! 6. Mile High Pumpkin Cream Pie (Lemons for Lulu) – Whoah, this pie sure is a mile high and delicious looking! A ginger snap cookie crust and a no bake filling, easy! 7. Maple Vegan Pumpkin Pie with Crumble Topping Recipe (Orchids and Sweet Tea) – I don’t think anyone would notice this delicious looking pie is also vegan with it’s great looking crumble topping! This vegan and dairy free pumpkin pie would be perfect for anyone. 8. Pumpkin Pecan Pie Recipe (Rachael Ray) – Can’t make up your mind between Pecan Pie and Pumpkin Pie? Combine them! 9. Dark Chocolate Pumpkin Pie with Chocolate Crust Recipe (Cooking LSL) – Everything is a little better with chocolate right? A homemade chocolate crust, pumpkin filling, and chocolate ganache topping. 10. Pumpkin Pie with Graham Cracker Crust Recipe (Jo Cooks) – Forget the traditional pie crust and give a graham cracker crust a try! Such a great combo with the pumpkin. 11. Bourbon Pumpkin Pie Recipe (The Lemon Press) – An easy homemade pumpkin pie recipe with a splash of bourbon. Yes, please! 12. Fresh Pumpkin Pie Recipe (Mom Noms) – If you’ve always used canned pumpkin, give this fresh pumpkin pie a try with homemade pumpkin purée. 13. Two-Crust Pumpkin Pie (NY Times) – This untraditional pumpkin pie also has a top crust as well as raisins in the pumpkin filling. Interesting! 14. Paleo Pumpkin Pie (Elana’s Pantry) – I’m sure many of you will have some Paleo guests or maybe you’re Paleo, either way, this Paleo Pumpkin Pie sounds fabulous! Homemade paleo pie crust along with a homemade filling of pumpkin, honey, coconut milk, spices, and more! 15. Eggnog Pumpkin Pie (The Gracious Wife) – No evaporated milk in this pie, instead lots of eggnog. Love that idea! 16. Pumpkin Apple Pie (Taste of Home) – If the pumpkin and pecan pie combo above wasn’t your thing, maybe an apple pie and pumpkin pie combo? Delish! 17. Streusel Crumb Topped Classic Pumpkin Pie (Gringalicious) – Streusel makes everything better, and this pie is no exception. From scratch pie crust, pumpkin pie filling, and a delicious streusel crumb topping. Yum!